MICHAEL D HIGGINS says everyone in society has a role to play in preventing suicide; the president has been highlighting the work of suicide charities today – speaking at the opening of a Console conference on the issue in Croke Park . His remarks follow the publication of a study last week showing that Ireland ranks fourth highest in the EU in terms of death by suicide among young people. The highest suicide rate recorded was amongst men aged 20 to 24, at 31.9 per 100,000 of the population. “When it comes to suicide, the answers do not lie exclusively with health care professionals, politicians or researchers. Every one of us has a role to play in giving shape to a national community that cares for all its citizens,” President Higgins said. He spoke of how hardly any community in Ireland had been spared the bewilderment and sorrow that surrounds suicide. He also spoke about the complex issues surrounding suicide, including the problems caused by depression. “Peer loyalty and the pressure to conform, especially pronounced among teenagers, can be another source of malaise feeding into suicidal dispositions,” the President said. He spoke of research carried out among young, working-class men in the Cork region which had identified a “culture of mocking, drug and alcohol abuse, reckless driving and use of homophobic jargon”. He said researchers had found that “those who fail to conform to such distorted versions of the ‘expectations of masculinity’” associated with the culture can feel “dangerously alienated and stigmatized”. The President said that the most damaging aspect of stigma, in terms of risk of suicide, is that it can prevent people from talking about their problems, and ultimately from seeking help. Also speaking at the Console conference, organised ahead of tomorrow’s World Suicide Prevention Day, CEO of the charity Paul Kelly called for Ireland to follow the example of Scotland in tackling the issue. Kelly said that Scotland had managed to reduce its suicide rate by 18 per cent over the past decade, partly as a result of a large scale awareness campaign in the health sector and in wider communities. He said more “training, targets and commitment” are needed for Ireland to implement a similar strategy, and called for more support for the National Office of Suicide Prevention. 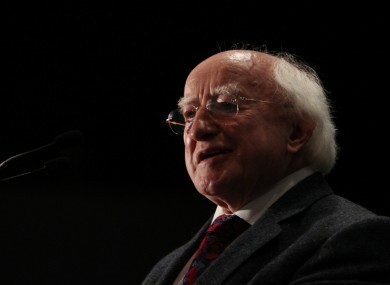 Email “President Higgins: Stigma a major barrier to suicide prevention”. Feedback on “President Higgins: Stigma a major barrier to suicide prevention”.